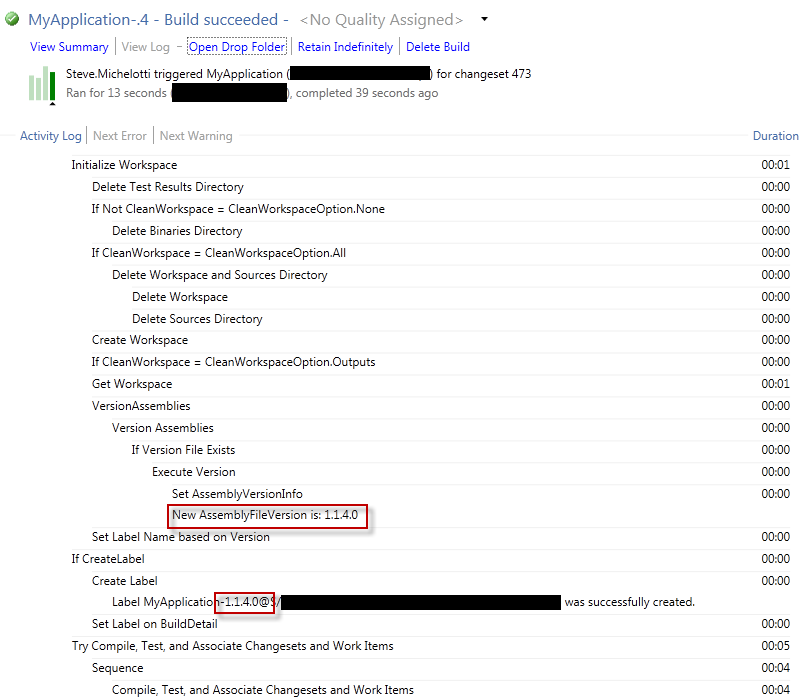 When I first heard that TFS 2010 had moved to Workflow Foundation for Team Build, I was extremely skeptical. I've loved MSBuild and didn't quite understand the reasons for this change. In fact, given that I've been exclusively using Cruise Control for Continuous Integration (CI) for the last 5+ years of my career, I was skeptical of TFS for CI in general. However, after going through the learning process for TFS 2010 recently, I'm starting to become a believer. I'm also starting to see some of the benefits with Workflow Foundation for the overall processing because it gives you constructs not available in MSBuild such as parallel tasks, better control flow constructs, and a slightly better customization story. The first customization I had to make to the build process was to version the assemblies of my solution. This is not new. In fact, I'd recommend reading Mike Fourie's well known post on Versioning Code in TFS before you get started. 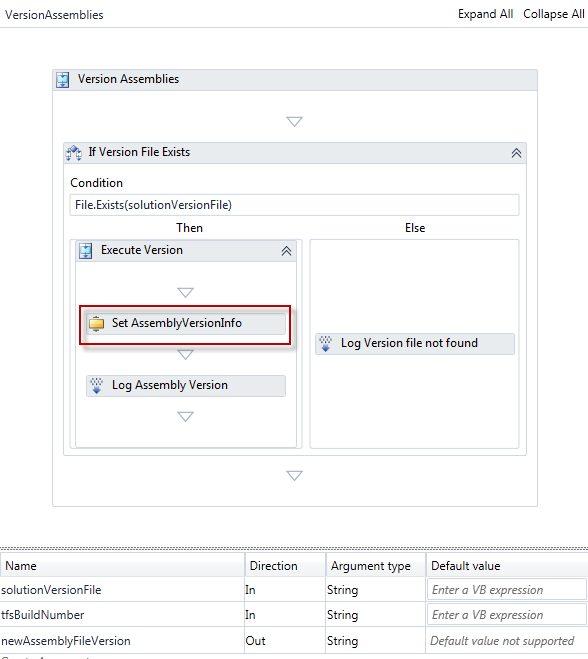 This post describes several foundational aspects of versioning assemblies regardless of your version of TFS. The main points are: 1) don't use source control operations for your version file, 2) use a schema like ...0, and 3) do not keep AssemblyVersion and AssemblyFileVersion in sync. 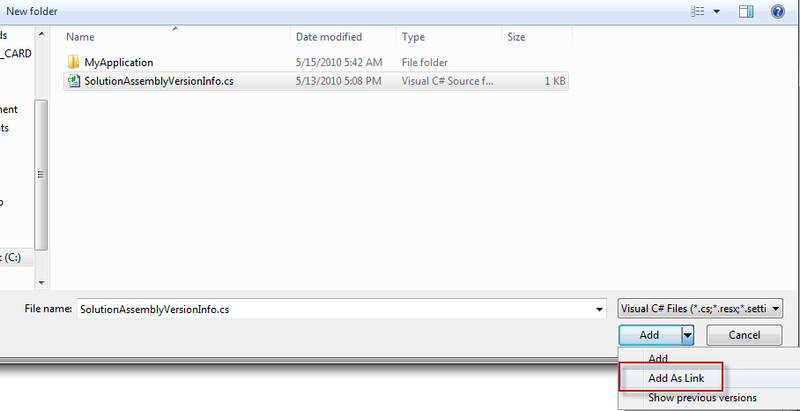 To do this in TFS 2010, the best post I've found has been Jim Lamb's post of building a custom TFS 2010 workflow activity. Overall, this post is excellent but the primary issue I have with it is that the assembly version numbers produced are based in a date and look like this: "2010.5.15.1". This is definitely not what I want. I want to be able to communicate to the developers and stakeholders that we are producing the "1.1 release" or "1.2 release" – which would have an assembly version number of "1.1.317.0" for example. In this post, I'll walk through the process of customizing the assembly version number based on this method – customizing the concepts in Lamb's post to suit my needs. I'll also be combining this with the concepts of Fourie's post – particularly with regards to the standards around how to version the assemblies. Now the Solution Explorer will show our file. We can see that it's a "link" file because of the black arrow in the icon within all our projects. 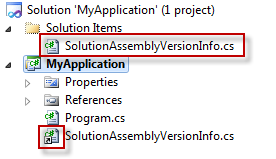 Of course you'll need to remove the AssemblyVersion and AssemblyFileVersion attributes from the AssemblyInfo.cs files to avoid the duplicate attributes since they now leave in the SolutionAssemblyVersionInfo.cs file. This is an extremely common technique so that all the projects in our solution can be versioned as a unit. At this point, we're ready to write our custom activity. The primary consideration is that I want the developer and/or tech lead to be able to easily be in control of the Major.Minor and then I want the CI process to add the third number with a unique incremental number. We'll leave the fourth position always "0" for now – it's held in reserve in case the day ever comes where we need to do an emergency patch to Production based on a branched version. Notice that the arguments of this activity are the "solutionVersionFile" and "tfsBuildNumber" which will be passed in. The tfsBuildNumber passed in will look something like this: "CI_MyApplication.4" and we'll need to grab the "4" (i.e., the incremental revision number) and put that in the third position. Then we'll need to honor whatever was specified for Major.Minor in the SolutionAssemblyVersionInfo.cs file. 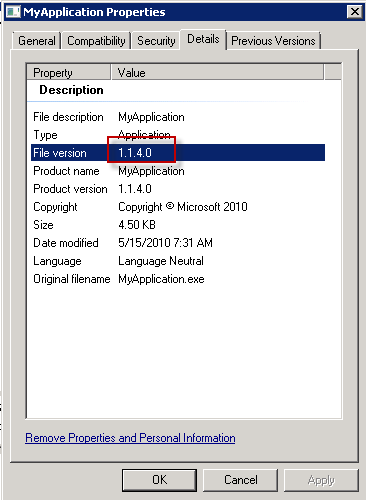 For example, if the SolutionAssemblyVersionInfo.cs file had "1.1.0.0" for the AssemblyVersion (as shown in the first code block near the beginning of this post), then we want to resulting file to have "1.1.4.0". At this point the final step is to incorporate this activity into the overall build template. Make a copy of the DefaultTempate.xaml – we'll call it DefaultTemplateWithVersioning.xaml. 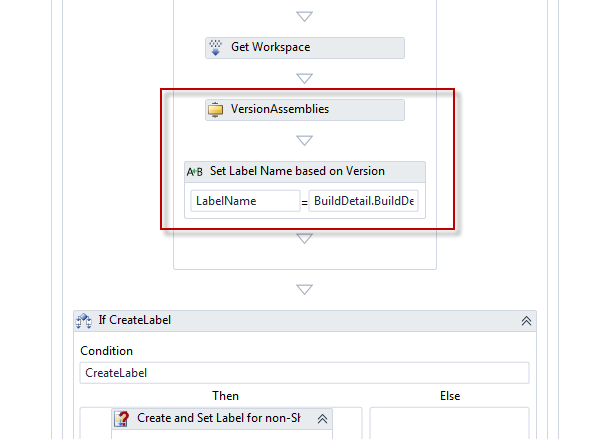 Before the build and labeling happens, drag the VersionAssemblies activity in. Then set the LabelName variable to* "BuildDetail.BuildDefinition.Name + "-" + newAssemblyFileVersion* since the newAssemblyFileVersion was produced by our activity. We now have full traceability for our code. There will never be a question of what code was deployed to Production. You can always see the assembly version in the properties of the physical assembly. That can be traced back to a label in TFS where the unique revision number matches. The label in TFS gives you the complete snapshot of the code in your source control repository at the time the code was built. This type of process for full traceability has been used for many years for CI – in fact, I've done similar things with CCNet and SVN for quite some time. This is simply the TFS implementation of that pattern. The new features that TFS 2010 give you to make these types of customizations in your build process are quite easy once you get over the initial curve.